Yippee! Put those boots on! I grew up in the '50s, when TV was small and black & white, when my mind was filled with the Lone Ranger and Tonto, and Roy Rogers, and later, the Cartwrights on their Ponderosa. My family would get together on Sunday night and watch Disney's "the Wonderful World of Color". After that came "Bonanza", filmed in the "West", with horses and pistols and stuff. 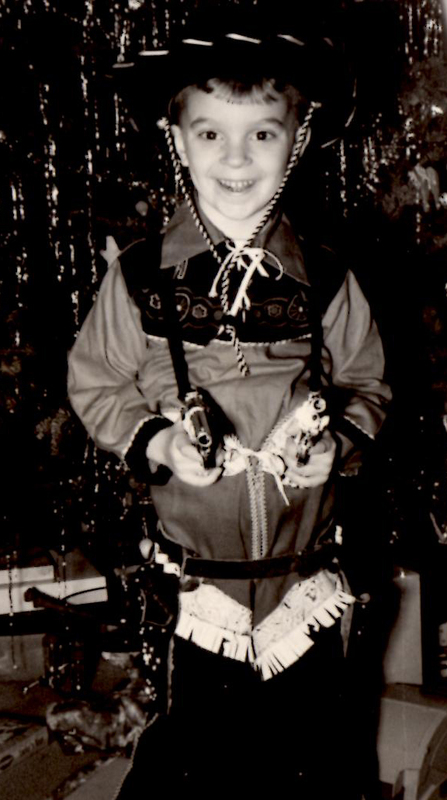 Oh, yea, I had the stuff - chaps, double 6 guns, the hat - and a perfectly sized hobby horse on springs. I would rock back and forth for hours, singing who knows what. I would pitch a fit when my Mom said I couldn't wear my chaps to school. Get a costume, wear the hat. What was your thing as a kid? "I reckon the Ponderosa holds about as much claim on us as we do to her. It's more like a partnership. Like we're all sort of beholdin' to one another. What I mean to say is that Pa won't let us cut down a tree unless there's another tree growin' to take its place, or take a cup of water outta the lake if it makes the lake go down too much. The Ponderosa's got a mighty lot to give. Like Pa says, we ain't to take one ounce out of her that she can't grow back." Special Thanks to Hank Shreve on the harmonica. Can you feel the campfire?